As a sneak preview, we present 7 of those artists whose focus is ‘figure or form’. 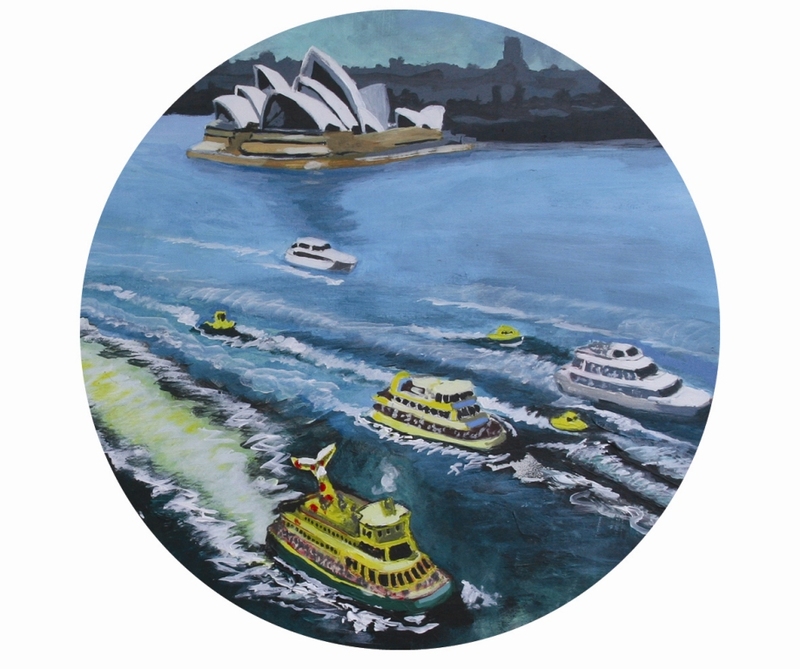 Cindy Goode Milman known for her figurative ocean swim and pool paintings unveils new works focussed on Sydney’s ferries in two distinct styles of works - poster art inspired paintings featuring Australia Day event Ferrython and the historical old charter craft as well as monochromatic moody works such as the moodiness of misty morning of ‘Narrabeen’ moored at Manly Wharf. Eunice McAllister unique digital collages move around the themes of single women in modern society and immigration, an experience of travelling without a return ticket. Using an almost aerial viewpoint, the finished works are evocative in layered form. Jessica Watts’s signature collaging of vintage old storybooks and bingo cards that underlay her popular Australian birds’ series makes a welcome return to Artspot alongside new works aptly named Wallflower, with a focus on the female forms, emerging from a background of vintage wallpapers. Michele Petrie’s masterful ceramic figurative work for this exhibition includes a collection of senior ‘beach babes’ and ‘surfer dudes’ who imprint their personalities and own kind of beauty on her clay sculptures. She brings a gentle humour to these figures, stating these are not the invisible elderly, but salt of the earth, worldly wise and inspirational force to be reckoned with! Pamela Pudan’s background of writing and psychoanalysis has influenced her clay works through an interest in form and in taking familiar things and trying to distil what is essential about them. She strips them of colour and attempts to capture the rhythm and pattern which through her eventual surrendering create beautiful ceramic works. Max Irvine creates 3D sculpture in steel depicting forms borne out of his career as a structural engineer fascination for geometry. Combined these skills enmesh to produce sculpture with unique plays on right triangles with a reflection of landscape form. A sight to behold. Artspot is a professional art exhibition made possible by our sponsors PCA, G Brothers Mercedes Benz, Raine and Horne Palm Beach, Baillie Lodges, Enliven Pittwater, Stoneleigh Wines and Avalon Palm Beach Business Chamber Inc. Article by Cindy Goode Milman, 2014.